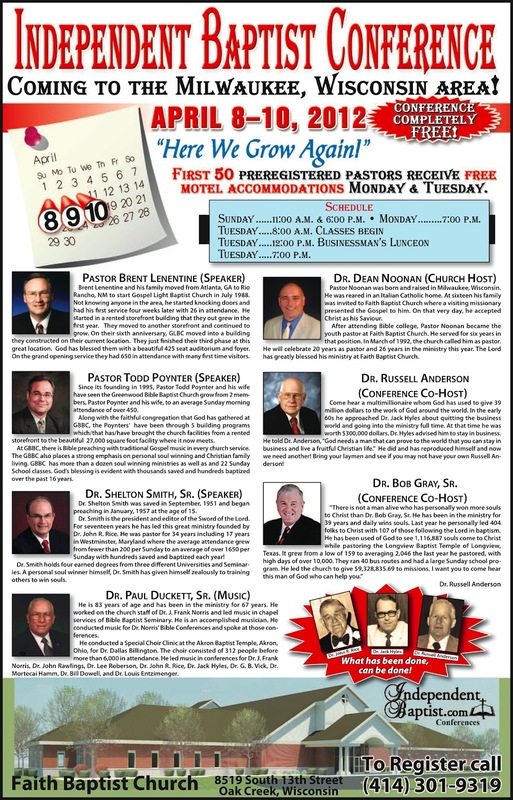 Please call now 414-301-9319 and pre-register for free motel rooms for Monday and Tuesday. The conference is free! Exciting old time music! Spirit-filled teaching and preaching. Classes on Tuesday for pastors and staff, laymen, ladies, and youth. Free luncheon on Tuesday hosted by Dr. Russell Anderson. The classes will be worth the trip as well as the refreshing night services. I wish every church in America could experience what Dr. Paul Duckett Sr. has to offer with his congregational singing. He led singing for J. Frank Norris, Dallas Billington, and led 300 plus voice choirs. He is a sweet man and has much to give to young men. We must gain from these great men before they go to Heaven. Dr. Russell Anderson will be 81 soon and our laymen need to learn the Bible principles he used to build 7 successful businesses. He was a Kentucky coal miner without any formal education yet God blessed him. Behind every great move of God you will find a man of God and behind that man of God you will find a layman of God! He will be teaching laymen on Tuesday morning. GOTTA LOVE THE SERVANTS OF GOD!